So, how is it going so far? You might be noticing some changes by today. If you suffer from inflammation, and that inflammation shows up in your face and body tissues, the puffiness may be beginning to reside by today. * Your head may be starting to clear and your thinking getting sharper. Here are our menu suggestions for Gettin' Your Greens on Day 3. We're recommending that you have a Super Green Smoothie again this morning because we believe in their powerful healing properties. However, if you find that they're just not for you, try substituting our farro and fried egg breakfast. Cooked farro is absolutely delicious and adding a fried egg makes this meal look more like a traditional breakfast. Be sure to add those super greens on the side for super energy! Bring 1 cup of farro* to a boil in 2 cups of organic chicken stock. Reduce the heat to low, cover and simmer for 25 minutes. Stir in 4 tablespoons of grass fed butter and salt and pepper to taste. Top a serving of the farro with super greens sauteed in olive oil, salt and pepper. 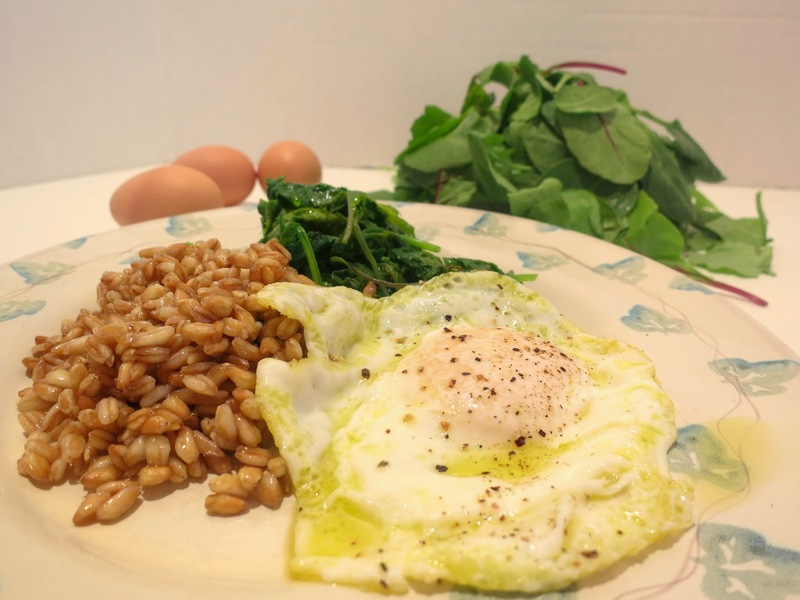 Gently fry a grass fed egg in grass fed butter and place it over the super greens and farro. If desired, pour a tablespoon of flax oil over the top for additional anti-inflammation healing. *If you can't find farro, try amaranth grains or pearl barley. They're all delicious prepared this way. Here's an easy-to-pack lunch. Using a large tortilla style wrap, make a sandwich with fresh kale, sliced red bell peppers, cucumbers, shredded carrots, hummus and tzatziki sauce or hummus and baba ghanoush. (You can find both the hummus and tzatziki at Trader Joe's.) To make lunch more filling, you could also pack 1/2 avocado with a little lemon juice, salt and pepper and your choice of fruit. Or, if you love a treat, try our fabulous recipe for low gluten, no sugar Toll House chocolate chip cookies, here. Roll 'er up, folks! A hummus and kale wrap that is delicious, filling and healthy! By the way, if you are on an anti-inflammation diet, you can use a gluten-free wrap. The wrap we used here is made primarily from teff, which is gluten-free. For tonight's dinner, how about adding an arugula salad to whatever protein and vegetable you have planned. If it's summer time, we love arugula and watermelon sprinkled with pine nuts and a little feta cheese. In the cooler months try arugula, pears, walnuts, dried cranberries and a little goat cheese. To make a great vinaigrette, mix together 2 T olive oil, 1 T flax oil, 1 T lemon juice, 2 t apple cider vinegar, 1/2 t Dijon mustard, 1/4 t dried dill, 2 T finely chopped shallots, sea salt and fresh ground pepper to taste. Pears with arugula and other super greens, cranberries, goat cheese and walnuts. We're hoping by this point you're getting the hang of Gettin' Your Greens On. It's easy to add greens into your daily life. Just start each day with a Super Green Smoothie or add some sauteed greens to your eggs or cooked grains for breakfast. For lunch, fortify your favorite sandwich with a big handful of fresh greens to add taste, flavor and healing punch. For dinner, add several handfuls of greens to just about any soup recipe, serve a salad made with super greens, or saute greens and serve them as a side dish. Hey, you're getting this! It's all just a matter of getting in the habit of Gettin' Your Greens On! *If you're one of those people that tends toward puffiness, it really takes a week of this to see radical results. In fact, if you want to ban puffiness altogether, make sure to avoid gluten, dairy and sugar while you're Gettin' Your Greens On. You'll be amazed at what a week of avoiding these three inflammatants and adding super greens will do for your appearance. Your skin will glow, your eyes will sparkle, your body tissues will de-puff and you will be leaner, stronger and more clear headed.